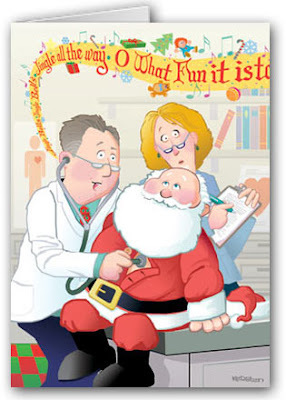 Weighty Matters: Santa's OK! Over 70 and overweight possibly a good idea. Santa's OK! Over 70 and overweight possibly a good idea. There have been a number of studies of late that have concluded that being overweight (not obese, overweight) and elderly is in fact a good combination. This study, published today in the Journal of the American Geriatric Society has Leon Flicker and his colleagues discussing the impact of weight on mortality over a 10 year period in 9,240 Australian men and women. The minimum mortality risk was found at a BMI of 26.6 and as BMI decreased from there, risk increased, with the risk of death with a BMI at the lower end of the "normal" range being nearly double the risk of those who were "overweight". These results were sustained even when stratified into groups of initially "healthy" versus initially "unhealthy" subjects and when years one, two and three were subtracted from the study to eliminate those who might have lost weight prior to enrolment due to a chronic illness. The one variable aside from weight that had a tremendous impact was being sedentary. Men who were sedentary were found to have a 28% increased risk of mortality across all weight categories while for women the risk was double! Class I Obese participants had very similar mortality risks to normal weight individuals though as weight went up from there, so too did risk. The results aren't exactly surprising. Previous studies have shown the same results and certainly the theory that older folks carrying some excess weight will have greater metabolic reserves to draw on to weather both chronic and acute medical conditions sounds feasible. The main limitation of this paper is that BMI was used as a surrogate measure of body fat. This becomes problematic in a geriatric population due to both the natural course of aging (loss of muscle and conversion to fat) as well as the fact that BMI does not identify those with greater stores of visceral fat. A minor limitation was that height and weight were self-reported and given that we know self-reported heights and weight tend to make people taller and skinnier than they actually are (a phenomenon that one might expect to be exacerbated by age-related shrinking (there's an easy paper for someone)). Interestingly though the paper's main limitations actually supports the authors' conclusions that BMI thresholds as we currently understand them likely should not apply to the geriatric population in that either weight is in and of itself protective or that BMI cannot identify risk in the elderly though perhaps fat distribution does (another potential paper), and while the authors for some reason didn't mention it in their conclusion, this paper would certainly suggest that the most important thing a primary care physician might do when faced with an overweight or obese geriatric patient would be to constantly encourage them to be active.